This is a double layered bow with Flowers everywhere. 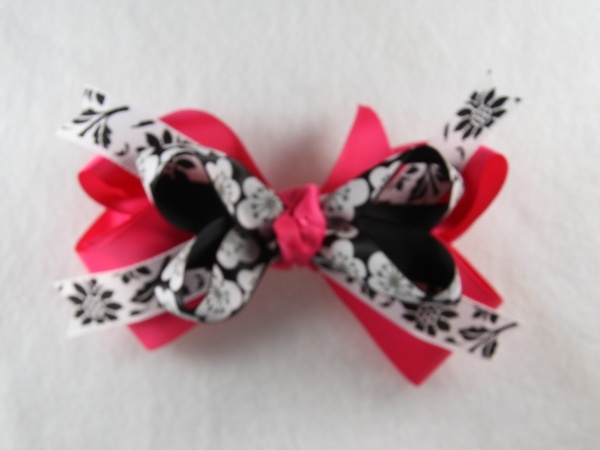 The base bow is a solid hot pink 1.5" grosgrain ribbon which also wraps the center into a French knot. The top bow is a satin black ribbon that has white flowers with a silver burst in the middle. The middle layer is 2 pieces of ribbon that cross over each other, it is a white grosgrain ribbon with black flowers. These two black and white ribbons contrast each other and really stand out against the hot pink.